MURRAY SPACE SHOES are truly custom made because our unique process captures all the three dimensional measurements, all the top, side and bottom contours of YOUR feet before shoemaking begins. We don’t pinch, squeeze or distort YOUR feet to put them into some arbitrary shape. Every shoe, boot and sandal is truly custom made for each foot by a unique molding process. Many shoemakers claim “custom made” for advertising purposes, but MURRAY SPACE SHOE really makes custom made shoes, custom made boots and custom made sandals according to the shape of YOUR feet. The inside of MURRAY SPACE SHOES are made to fit YOUR feet. MURRAY SPACE SHOES are custom made by molding them to plaster casts the shape and size of YOUR individual feet. That is WHY they are the most comfortable shoes in the World! This is just a sampling of the many styles we can make. We specialize in making shoes to fit YOUR feet. You need to bring us YOUR feet for casting before we can begin to make your shoes. Because YOUR feet are so important we don’t accept casts from anyone else. We ONLY do the whole process from start to finish. We don’t use middlemen. You are casted by the same craftsman who will make YOUR shoes. We believe in direct one to one communication so that you can receive the highest quality service possible and the finest footwear we can make. We have also developed a unique process whereby we can hand make our footwear in denim and many other specialty cloths including hemp. 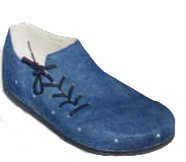 You really have to experience BLUE JEAN SHOES for yourself to understand the way they feel. If you really want to make an exciting fashion statement cloth shoes may be just the answer because they are also extreamly comfortable and light. For your FEET to have a glorious walk through life, treat your FEET to a pair of MURRAY SPACE SHOES. 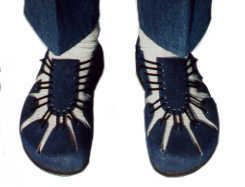 The shoes that Danny Kaye and Alan E. Murray, the creator, made famous. When you visit us in person for a cast of your FEET and a pair of MURRAY SPACE SHOES, upon request we will show you 18 pairs of MURRAY SPACE SHOES worn by Danny Kaye, of which he had a total of 40 pairs, and which he personally put on his FEET for us. We had the pleasure and honor of fabricating eight pairs for him and enjoyed his fabulous company after we opened our MURRAY SPACE SHOE shop in Mountain View, California in 1979. Since then we have re-located to the beautiful Capay Valley. 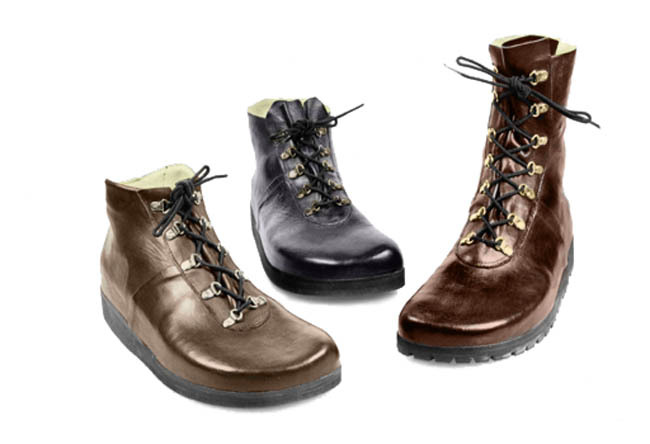 Hand made shoes, boots and sandals by Murray Space Shoe are custom made and molded for fit and comfort. What is a MURRAY SPACE SHOE? Do you think your feet are important? Why should you consider MURRAY SPACE SHOES? Would you like to read testimonials? Did you know Danny Kaye had 40 pairs? How to contact us for a brochure or to make an appointment?